Unit work & family. Yes, you can! Be the mom you wanna be while earning enough money working from home to afford the lifestyle you desire. … a stressed mom struggling each day to get by and make ends meet? …worried about not being able to pay the bills at the end of the month? … feeling unappreciated for being “just” a mom and not contributing to the family’s bottom line? … agonizing over finding a possibility to be there when your kids need you AND still make some money? Deep down you know these things won’t change – unless YOU change them. > You get up in the morning with a smile on your face, feeling excited about starting your day. Because you do something you love. > Even better, you don’t have to worry about paying the bills at the end of the month anymore. Because you earn enough money working from home. > You never miss your kid’s soccer game and are always there when they are sick or need your help. Because working from home and on your own terms gives you that kind of flexibility. > You are astonished by all the new skills you learned within that short period of time and are proud to set such an excellent example for your kids. You know you can teach them some invaluable lessons about creating a successful life. Because you have done it. What is the Solopreneur Safety Net & how can it help you? 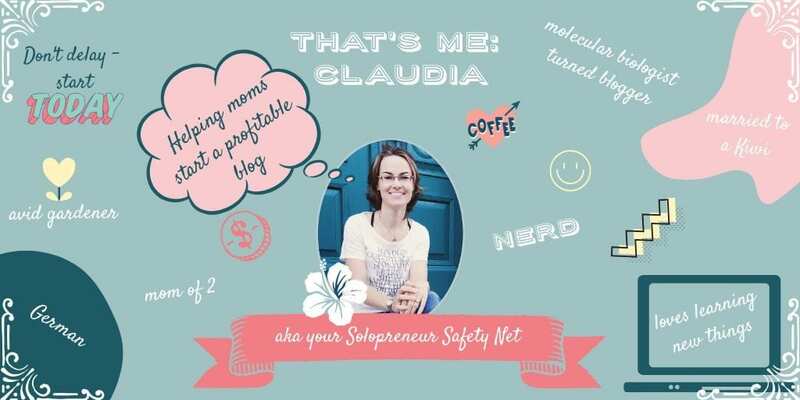 The Solopreneur Safety Net – that’s me: Claudia. 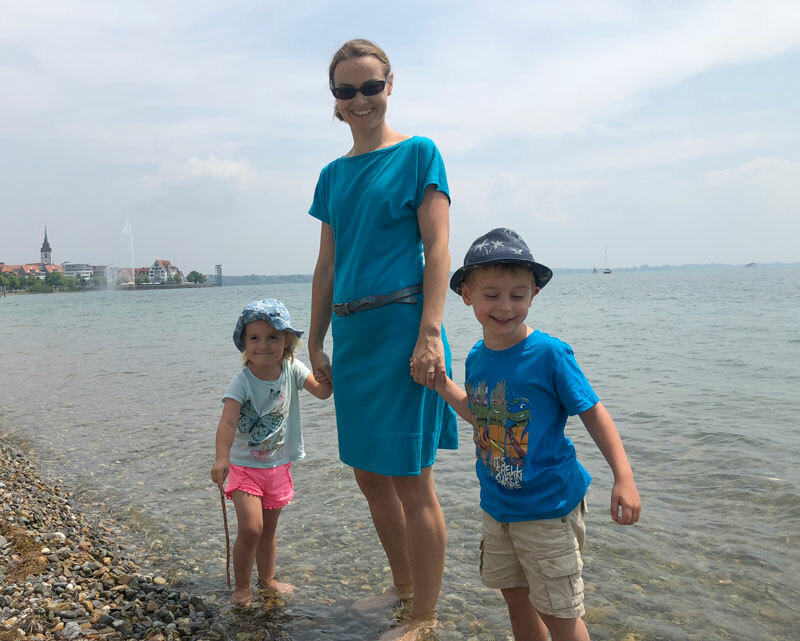 =) I’m a scientist-turned-work-at home mom of 2 from Germany. I know from experience how hard it is to unite the traditional mom role with the need for a second income to afford the lifestyle you want. So what’s the solution to that dilemma? Right. You find a way to work from home and become your own boss. That’s what I decided to do and what I would love to help you with too, by showing you everything I’ve learned about building a profitable blog. I don’t claim to have all the answers. But as an advocate for life-long learning, I’ll keep educating myself and I’ll share everything I learn along the way. So you can learn from my mistakes or try out strategies that work for me. I’ll take you by the hand and show you what to do. Step by step. I’ll be your safety net. Join my inner circle and I’ll share my struggles, strategies, secrets, and results with you, so you can use and adapt them to build your own empire. Are you in? > Get excited about your future business & life! > Commit to putting in the work. > Join the inner circle. > Get your free “Secret path to building a profitable blog from scratch“-guide to gain an overview of what lies ahead of you. > When you’re ready to kick things up a notch, check out my “Work From Home Made Easy” Business Plan Bundle to create a rock-solid foundation for your new venture. Can’t wait to welcome you to my tribe! 🙂 Talk soon! PS: If you’d like to get in touch because you would like to inquire about a collaboration, have a question about a product, or want to give a testimonial, please use this contact form and I’ll get back to you as soon as possible. For all other questions feel free to reply to my newsletter to get in touch.